Easter Events starts today: 21/04 and ends in 25/04. Each person can use max 2 characters! Players that cheat will be punished. To join the event say !event. After this you can start searching eggs or killing pokemons. This is individual mission in which you have to find 130 kinder surprise eggs that are split all around the map. Some eggs may be hidden inside chests and others. Premium is required to be able to reach places where some eggs are hidden. For completing this mission you'll receive random TM00-201 excluding selfdestruction, natural gift and few weak tms like thunder bolt, smart strike etc and an orange easter key. This is as well individual mission. Here you have to defeat 1000 easter Pokemons. For completing this mission you'll receive a blue easter key and a new pokemon, only if you finish both mission. This mission will be available in Tuesday or Wednesday. It is Global mission for each server. For completing Eggs Hunt and Pokemons Hunt you have received two keys. They can open locked eggs that are split all around the map, but this time in many hard places, quests, spawns etc. Each player can open only 1 egg of each color (orange and blue). There are 100 blue eggs and 100 orange eggs so to let server success you have to work together. If your server win, we'll add respawn of Goomy (Goodra is the final evolution). New Pokemons will be available in the end of this week after client update. If you receive one of the new tms, please don't be worried if it doesn't work, we're currently finishing them and it takes a lot of time to add to several pokemons and set the right damage. Threads with spoils for eggs positions are FORBIDDEN! Will be there an Easter Event? - Yes, probably this weekend. How will be the Easter Event? What rewards will be from Easter Event? one of those will be obtainable AFTER server successfuly finishes the event. We haven't decided which one yet. Will be there something else besides of Easter Event? When will third island of Alola be launched? - Probably soon after Easter. Which Pokemons can learn new TMs? - The list will be provided in Friday or earlier. How we'll be able to obtain new Tms? How we'll be able to get Natural Gift and Selfdestruction? - The first one will be rare only from lotteries, contests and tournaments. The second one will be less rare, obtainable the same way as the first one, but also mini events. 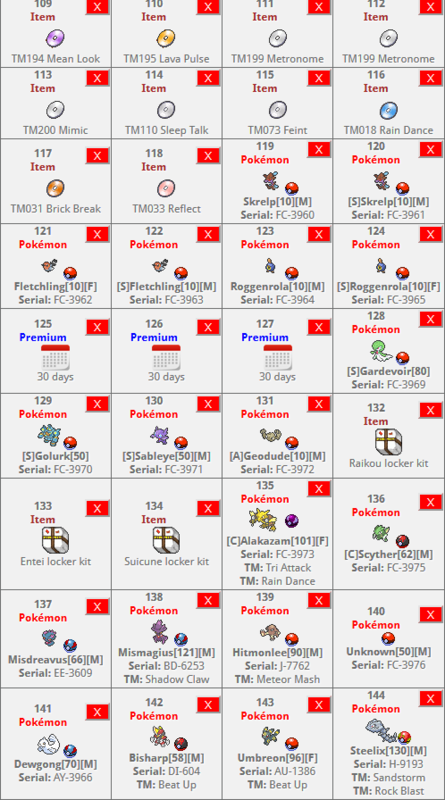 How can we obtain New Mega pokemons? - They will be spawning on third Alolan Island, Mega Heracross can be obtained for over a year thanks to existing secret achievement that nobody knows about. I can only give you a hint that it is related to some of previous events, but can be done any time, even now. Where Pokemons for lotteries come from? - Many of them are from deleted players, that we are sure of giving no second chances for. Some are created by staff. When will be next, free or paid lottery? - We are not planning on adding free lotteries anymore. They will always be paid for in-game money for low or higher price. We're planning to do mini lotteries with low amount of rewards and tickets for lucky players that are online at the moment of announcing lottery. It will be probably done every 1 or 2 weekends. (with smaller rewards than usual, as mentioned, that's gonna be a mini lottery). Big lotteries will be done with some occasion, for example next one for children's day 1/06. We don't plan to add more lotteries like this one this year anymore. How many tickets can we get? - Max 2 per person. Can I sell Easter lottery ticket in game to other players? - Where can I see list of rewards? You can get ticket for 150HD from NPC Lalo in PVP. 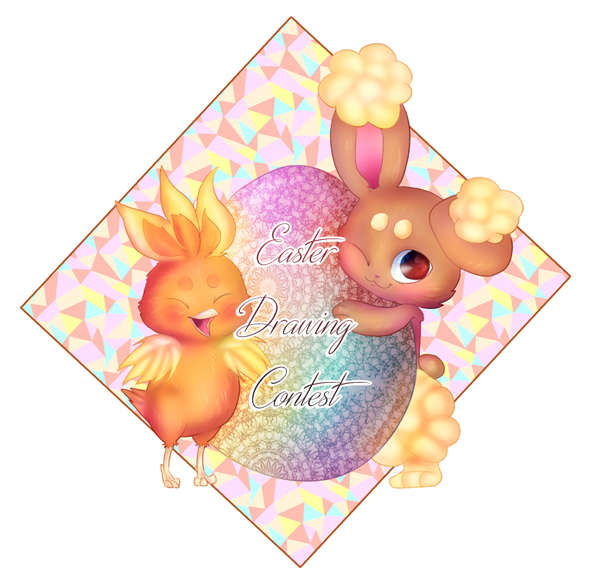 Since Easter is incoming, we are organizing a drawing contest! - Draw a real life picture. - Scan your picture or take a photo of it and post in this thread. - Sign with your character name on the draw is REQUIRED. Without this, the picture will be disqualified. - You can post max 3 pictures. We'll choose the best one. - You can participate in both currently running contests, however you can win only once. 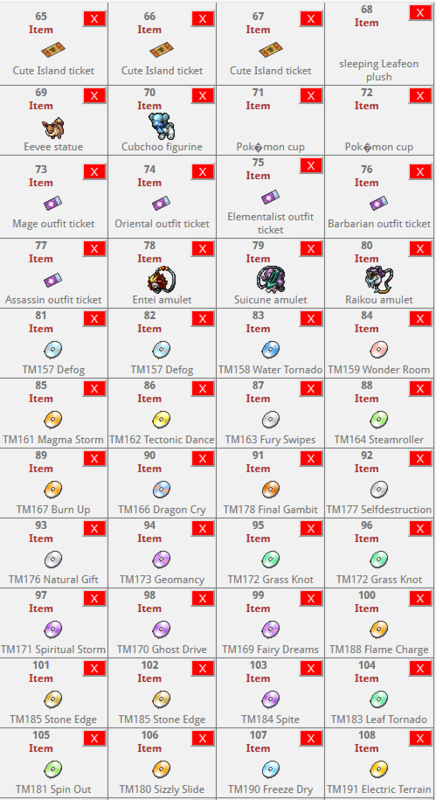 ** If you don't want this TM (it's gonna ba available only from contests and tournaments) or any other TM from 156 to 200. *** You can choose which ticket you want: Cloned / Ultra Wormhole Key / Twin Rocks/ Cute / other? * You can choose any Box 4 (Kanto/Johto/Hoenn) or Elemental. ** You can choose which ticket you want: Cloned / Ultra Wormhole Key / Twin Rocks/ Cute / other? 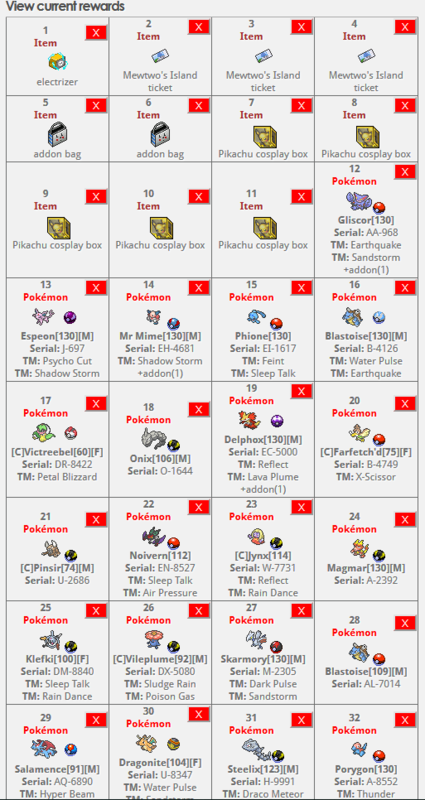 There will also be winner of players' choice with TM Case / New TM as a reward. We'll decide later if there will be a poll or we'll be asking 30-50 random players for opinion. [FONT=Times New Roman]- The Story has to be related to easter and has to include Pokemon. - The story has to be written by you, not by uncle google. You can do it with your friend, but remember, that reward will be split in two. - Pictures are appreciated as we'll give extra points for effort! Only your own pictures are allowed, made in: Game (screens), paint, photoshop or a real draw. - The story has to be written in english. You can always ask tutors/gms or cms for help in translation. *If you don't want this TM (and it will be obtainable only fron contests and tournaments) then you can choose any other from 156-200. * You can choose which ticket you want: Cloned / Ultra Wormhole Key / Twin Rocks/ Cute / other? *You can choose any box 4 (Kanto/Johto/Hoenn) or Elemental. 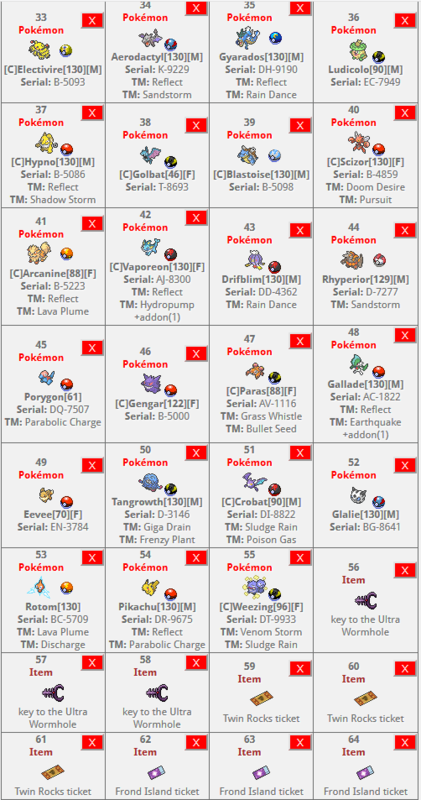 Global Random Tournament 2019 will take the place at 06/04 Saturday 18:00 - Drawing Pokemons 19:30 GMT+2 (central europe summer time) - Starting duels. - You can sign up with only one character. - Your character must be of level 120 or higher. - 2 players from each group will advance to the next stage (unless your group will have less players). - Right before tournament each player will draw for himself 8 random pokemons, which will be hidden in bags. - Each bag will have few different pokemons, player will have to choose bag + slot number to get 1 pokemon. - You can sign up in this thread already, positing your name. Although we'll be checking who's online or offline right before duels. - Transfering to tournament world will cost 3 diamond. - kick didn't happen more than 2 times. 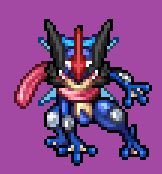 *Ash Greninja is treaten as a Mega Pokemon. It's way stronger than it's normal version. Recently we have balanced it better. It's double team works as it should again, its moveset has been improved. * Pikachu cosplay with full moveset and TM set + 1 unique spell depending on which cosplay winner choose. We've decided to create a new thread. It's easier to manage also it won't confuse anyone to find out which spoilers are for which islands. - Ula'Ula Island is located to the south from Akala. - There are 2 big houses, one of them is on the top of Lanakila mountain - near to two spawns of level 200+ (psychic and ice) thanks to this house you can also skip walking through stairs maze, that any other player will always have to walk through to reach this place. - There are 5 medium sized houses, one of them on Lanakila mountain with the same features as described above. - Grass 210 [level gate] ---> there will be spawn of Leafeon - Shiny Leafeon. The second one will be catchable. - Ice 200 [level gate] ----> there will be spawn of Glaceon - Shiny Glaceon. The second one will be catchable. According to Bulbapedia, Diancie is a mythical Pokemon. However we'll treat it as normal, but rare Pokemon, that will also be able to Mega Evolve. Diancie is born from a Carbink that undergoes a mutation. As you already know carbink does not have its spawn. It can appear while minning crystals on Melemele Island. The same will be possible on Ula'Ula Island. There will be a very rare chance that Diancie will appear instead of a Carbink. Since it's going to be based on minning, which has 2 minutes of cooldown, Diancie will have easy catch rate (comparable to Pokemons of 1st evolution). - The rest to be announced later! 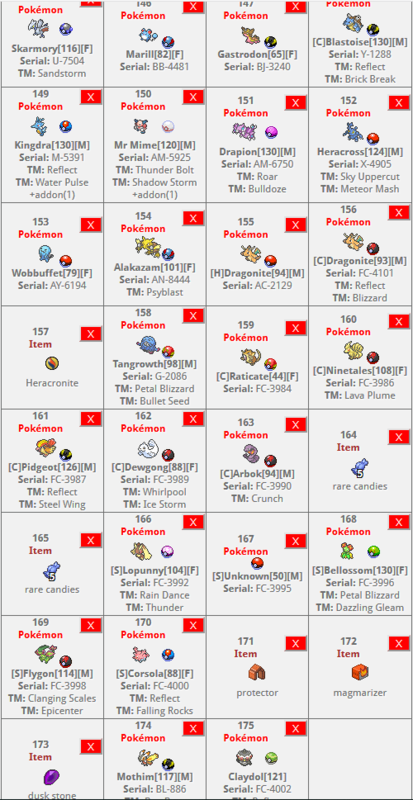 List of new shinies will be provided within some hours. It’s your chance! Just sign up here! Keep in mind that there are some requirements, though. • Be an active and helpful player. • Know and follow all Rules. • Have the desire to help players and the community. • Have good behaviour. This includes all things like scamming. • Players with newly created account on forum will not be considered. Don't sign up here unless you can satisfy the position! To sign up, fill the following form and post it here. Posts that don't follow the form will be deleted without warning, aswell comments. If you have questions, you can send me a private message in forums or contact me in game. ATTENTION:we reserve the right to DENY ANY PLAYER that we judge as not capable for a tutor position due to bad behavior, bad historic or inactivity. The topic will remain open for 7 days from now. Any post non related to the main reason of this thread will be deleted. First of all we are sorry for the delay. Event is very simple. Find Npc Giorgia (kanto) and ask him for instructions. Event will last 3-4 days.